From the Forums is a great way to see what all of the current hot topics are on the TiPb forums. In order to create any new threads of your own or reply to any of the existing threads, you must be a registered member. Becoming a member is a simple process that will only take a few minutes out of your day, so if you have not already already done so, head on over and register now. It's week 2 of the Smartphone Round Robin and that means Phil from WMExperts is a guest in our forums, go easy on him and help him out with all of his questions he has regarding the iPhone! Whether you have a 4 GB, 8 GB, 16 GB, or 32 GB iPhone - how much free space do you currently have? Wondering what the latest and greatest iPhone apps are in the App Store today? We have a forum for that. 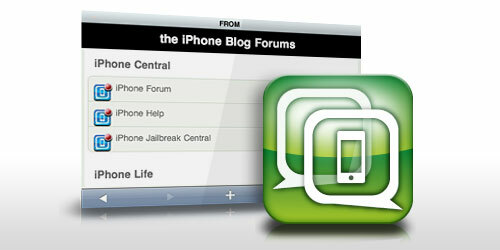 Visit our iPhone App Announcement forum. Think of a world where the iPhone simply does not exist (I know it's painful but try...) What phone would you choose to be your daily driver?